Intel shares are soaring today, and for good reason. The PC market is not quite dead yet, nor will it be in the foreseeable future. Intel (NASDAQ:INTC) shares had popped 6.9% higher as of 2 p.m. EDT Friday. The sudden move added 12 points to the Dow Jones Industrial Average (DJINDICES:^DJI) all by itself. Moving the price-weighted index this far in one day is impressive for a stock trading below $30 a share. By comparison, IBM (NYSE:IBM) would contribute or remove 11 points with just a 0.9% price change, given its near-$200 share price. So what's the rocket fuel behind Intel's big move? Stocks often swing up or down for no apparent reason, but this is different. For once, this market-moving price change is motivated by a perfectly reasonable catalyst. After deploying life-saving measures of the most modern kind, the doctors can finally sigh these sweet words: "I think he's gonna live!" In a press release and an 8-K SEC filing last night, Intel effectively stepped out of the operating room with good news for the patient's relatives: The PC isn't dying, after all. In more investor-friendly terms, Intel is seeing strong demand for business-grade PC systems. As a result, the company raised its second-quarter revenue outlook by 5% while narrowing the guidance range. 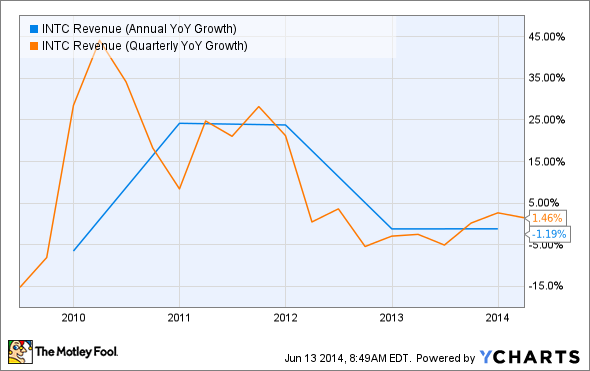 For the full year, Intel now expects "some revenue growth," up from a flat outlook. Moreover, the chips that go into business PC systems tend to be high-margin products. Therefore, gross margin in the second quarter should land near 64% -- a 1% increase from the first-quarter report's guidance section. Full-year gross margin should land in the upper half of the previous projection, somewhere near 61%. 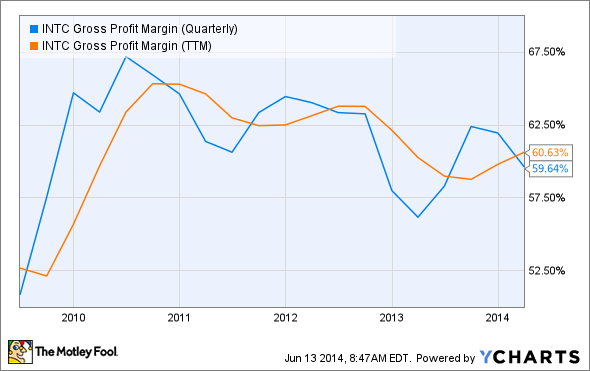 INTC Gross Profit Margin (Quarterly) data by YCharts. INTC Revenue (Annual YoY Growth) data by YCharts. Intel's guidance update earns some extra gravitas from the fact that the company rarely changes its forecasts in midquarter. The chipmaker lowered its third-quarter sales guidance in mid-September 2012, about a month before the official report. Macroeconomic pressures were holding back personal-computer system sales, particularly in -- you guessed it -- the corporate PC market. That warning sparked a 10-week selling spree. Intel shares fell nearly 30% while the Dow dropped just 4%. Intel sliced 47 points off the Dow in this period. I bought my Intel shares near the bottom of that trough. That wasn't market timing, just buying a quality business when everyone else was selling. And I locked in an effective dividend yield of 4.5%. Not too shabby. "The rumors of Intel's demise have been blown out of proportion," I said at the time. My position has grown by 48% as of today, or 55% if you include five quarters' worth of reinvested dividends. It feels good to be proven right, even when Intel's undervalued state should have been obvious in 2012. According to The Wall Street Journal, this is the first time Intel raised guidance in the middle of a quarter since 2009. That sunny forecast boosted Intel shares by 4% the next day, while also driving archrival Advanced Micro Devices (NASDAQ:AMD) 6% higher. AMD opened today's session 2.3% higher thanks to Intel's rosy market news. System-building titan Hewlett-Packard (NYSE:HPQ) rose 2% overnight, since Intel's strong component sales point to a surging market for complete systems, too. Meanwhile, IBM shares didn't react at all to Intel's PC-market news. Big Blue is selling its Intel-based server line to Chinese rival Lenovo, which also bought IBM's desktop and notebook operations a decade ago. IBM just doesn't have a dog in this particular race anymore, and is moving away from hardware sales in general. Doctor Intel is not only in, he's back with a vengeance. Tablets and smartphones may be killing the consumer PC market, but businesses still need their desktop-style workstations.